Some time ago I administered a small scale survey exploring the relations between one's mindset and several other variables. 70 People filled in that survey. Today, I did some analyses on the data. The survey had two sets of independent variables. The first set consisted of variables measuring the respondent's mindset. Respondents had to say, on a five point scale, to what extent they agreed with 16 statements about how people become successful at work. 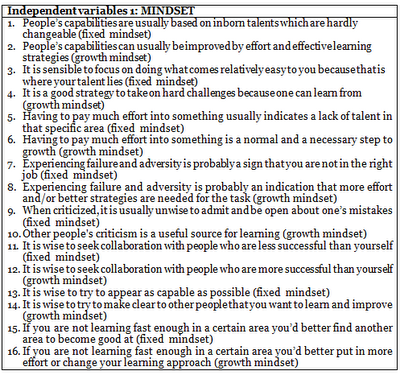 Half of the items represented typical growth mindset beliefs; the other half represented typical fixed mindset beliefs (see figure below). 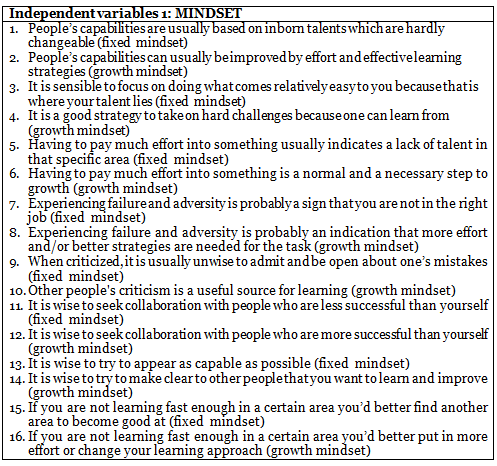 Based on these variables I computed one GROWTH MINDSET score for each respondent. The second set of independent variables consisted of variables measuring the respondent's effort to improve one's own and other people's performance (see figure below). Based on these items I computed one EFFORT score for each respondent. There were two sets of dependent variables. The first set measured perceived autonomy, perceived relatedness, and perceived competence (see figure below). These variables are the three basic universal psychological needs that self-determination theory researchers have extensively investigated. Fulfillment of these needs is associated with human wellness. 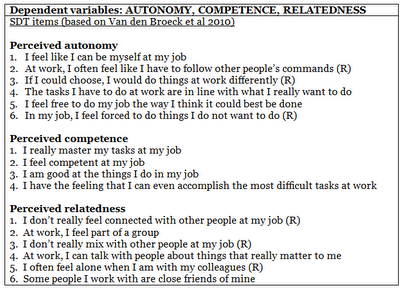 Based on these variables scores for AUTONOMY, COMPETENCE and RELATEDNESS were calculated. 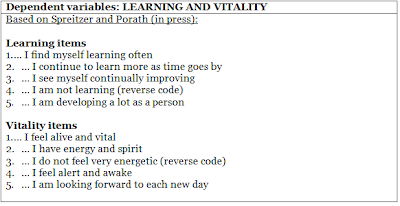 The second set of dependent variables measured learning and vitality (see figure below). As Spreitzer and Porath (in press) say, human thriving may be defined as the joint experience of vitality and learning. 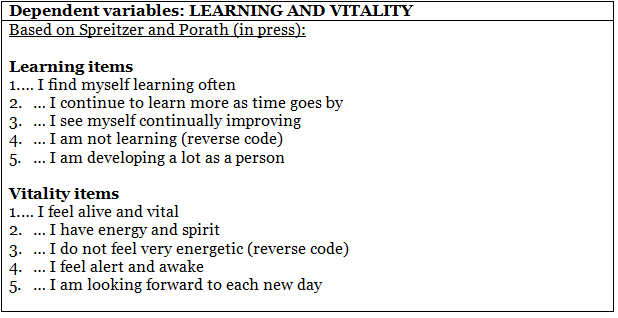 Based on these variables scores for LEARNING and VITALITY were calculated. The table below shows the correlations I found (click to enlarge). I accentuated significant correlations. A growth mindset is associated with effort wich is conform expectation. When one beliefs that people can develop their capabilities through effort it is only logical to put more effort the development of one's own capabilities and those of other people. A growth mindset is also associated with the fulfilment of two of three basic needs (competence and relatedness). This suggests a link between a growth mindset and welness. A growth mindset is associated with learning and vitality. As the the joint experience of learning and vitality is a good measure of thriving, according to Spreitzer and Porath, this suggests that a growth mindset is associated with human thriving. Update 14 november 2012: After discovering an error in my calculations I corrected the error and updated the post. The correction shows that the growth mindset is not only associated with effort, competence, learning and vitality, but also with relatedness.